Lent is an observance lasting 40 days starting on Ash Wednesday and ending just before Easter Sunday. The purpose of Lent is to focus on Jesus’ sacrifice on the cross and the miracle of His Resurrection. During the Lenten season many people make a personal commitment to fasting or giving up certain things in their lives as an act of penitence. Mardi Gras, or “Fat Tuesday,” is the Tuesday before Lent begins. The official start of the Lenten Season is Ash Wednesday. Why 40 days? The number is significant throughout Scripture; Noah was on the Ark for 40 days, Moses fasted 40 days before receiving the Ten Commandments and Jesus spent 40 days fasting in preparation for His work on earth. 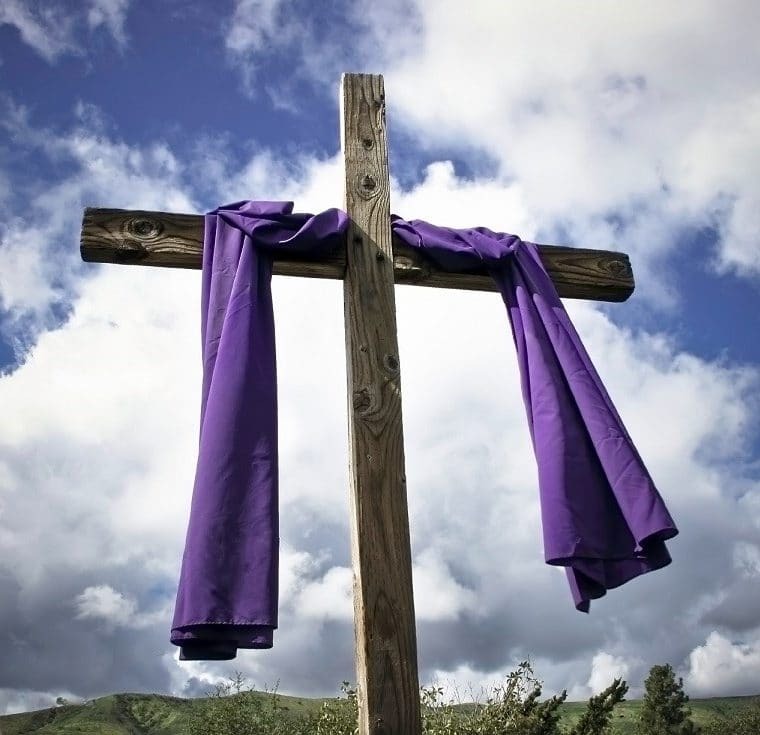 The liturgical color for Lent is purple, the color of repentance and sorrow for sin. The celebration of Lent is not a commandment but an opportunity to renew our faith and edify our spirit. Fasting is one of the traditions of Lent. The faithful abstain from meat on Fridays throughout the season and undertake specific fasts on both Ash Wednesday and Good Friday. Fasting does not mean a complete denial of food. Catholics eat one full meal and two smaller meals that together do not constitute a full meal when fasting. Take a look at some great Lenten recipes here. The Holy Scriptures are filled with examples of fasting. Most notably, Jesus fasted for 40 days in the wilderness while He prepared for His public ministry. For many, fasting can intensify their prayer life and connection to God. Members of the Church are encouraged to make a sacrifice for Lent. In some cases this means making a commitment to stop a sin they’ve been struggling with or doing something they wouldn’t normally do such as volunteering at a food bank. The purpose of abstinence is to spiritually echo the sacrifice Jesus made for us and to edify our spirits by focusing on something specific that could use attention in our lives. Ash Wednesday signifies the start of Lent. The day is often started with a service where members are asked to recognize their own mortality, repent their sins, and return to God. On Ash Wednesday the faithful begin their Lenten sacrifices and commit to changes in their lives. At Ash Wednesday services, a priest marks the sign of the cross on each person’s forehead with ashes. The ashes are an important symbol that represents mortality and repentance. Ashes connect with mortality because when we die our bodies fade away to ash and with repentance because in Scripture people would put ashes on their head and wear sackcloth as an act of contrition. The ashes have further meaning in that the ashes used come from the previous year’s Palm Sunday. The palms used on Palm Sunday are burned and mixed with water, which is symbolic of tears. Most Catholic churches contain a series of artistic depictions of Christ carrying the cross to His crucifixion. These works of art are used most often in the Lenten season to help people make a spiritual pilgrimage of prayer that focuses on Christ’s journey and sacrifice for us. Services are held throughout Lent that guide people through these stations, contemplating specific Scriptures and praying at each station. Although it is not traditional, sometimes a 15th station is added depicting Jesus’ resurrection. Palm Sunday is the Sunday before Easter and celebrates Jesus’ entrance into Jerusalem. This is an event noted in all four of the Gospels. Jesus rode a donkey into the holy city and the crowds laid down their cloaks and small branches in front of Him. This covering of Jesus’ path was a tradition of the day meant to communicate that the person was due the highest honor. As with all of the events surrounding Lent, Palm Sunday is rich with symbolism. The donkey is a peaceful animal as opposed to a horse that was often ridden for war. The palm branch is a symbol of victory in some cultures and a symbol of eternal life in others. Palm Sunday now coincides with Passion Sunday and a special Mass is held, during which Jesus’ betrayal and crucifixion is read from the Gospel. During Lent, Good Friday is the Friday before Easter. It is meant to commemorate the crucifixion of Jesus and His death on the cross. The day is also known as Holy Friday or Easter Friday. Good Friday is a day of fasting which means the faithful will have one full meal that is smaller than a regular meal and two smaller portions that together do not equal one meal. The Saturday of Holy Week is known as Holy Saturday, sometimes called the Saturday of Light. It immediately follows Good Friday and is the day set aside during Lent where Christians prepare for Easter. The day is meant to commemorate the day that Jesus was put in the tomb. During Holy Saturday all Masses are restricted. No Mass appears in the liturgy for Holy Saturday. For extremely grave or solemn situations special dispensation may be given to hold a Mass but typically no Mass is held. Holy Saturday lasts until 6 p.m. or dusk. Then an Easter Vigil Mass is celebrated that marks the start of the Easter Season.